•Changing the Background Color: To change the background color of a 2D or 3D Viewer, right-click anywhere within the viewer, and select Background Color from the pop-up menu. The Color combo box will display on your screen. Select a new color and then click the [OK] button. •Showing the Viewer Axis: To show or hide the viewer axis, right-click anywhere within the viewer, and select Axis from the pop-up menu. The following settings only apply to 3D Viewers. •Setting the Vertical Exaggeration: The Vertical Exaggeration is the ratio of the scale of the Y-axis to the scale of the X-axis. Vertical exaggeration can be used for discerning subtle topographic features or when the data covers a large horizontal distance (miles) relative to the relief (feet). By default, the vertical exaggeration is set to 0. You can change the vertical exaggeration using the Exaggeration text box, located at the bottom of the 3D Viewer (shown below). •Resetting the Viewer: To zoom out to the full extents of your data click the Reset Scene Position button located at the bottom of the viewer. Please Note: clicking this button will reset the rotation and zoom level back to the original view configuration. •Right-click anywhere inside the 3D Viewer, and select CutAway Properties from the pop-up menu. The following dialog box will display on your screen. •Click the CutOffs Active check box to enable CutAways. •Under the Activity tab, specify which slices to make active by clicking the appropriate Active check boxes. The YZ slice refers to a vertical plane along the Y and Z axis, the XZ slice refer to a vertical plane along the X and Z axis, and the YZ slice refers to a horizontal plane along the Y and Z axis. •For each active slice, select which portion to remove from the viewer (for example, the portion of the model that is left or right side of the slice, before or after the slice, or above or under the slice). •By default, the position of each slice is automatically positioned in the middle of the data along its respective axis. However, you can manually change the position of the slice by entering a new value in the Position field. Please Note: the Xmin, Xmax, Ymin, Ymax, Zmin and Zmax fields are read-only, and cannot be changed. 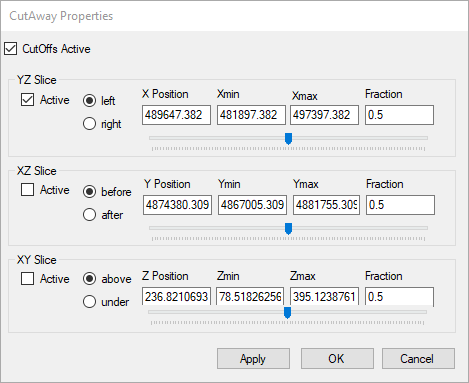 •Alternatively, you can set the position of a slice by entering a value in the Fraction field. For example a fraction value of 0.5 will set the slice position in the middle of the 3D data. •Click the [OK] button to apply the changes to the current 3D Viewer.